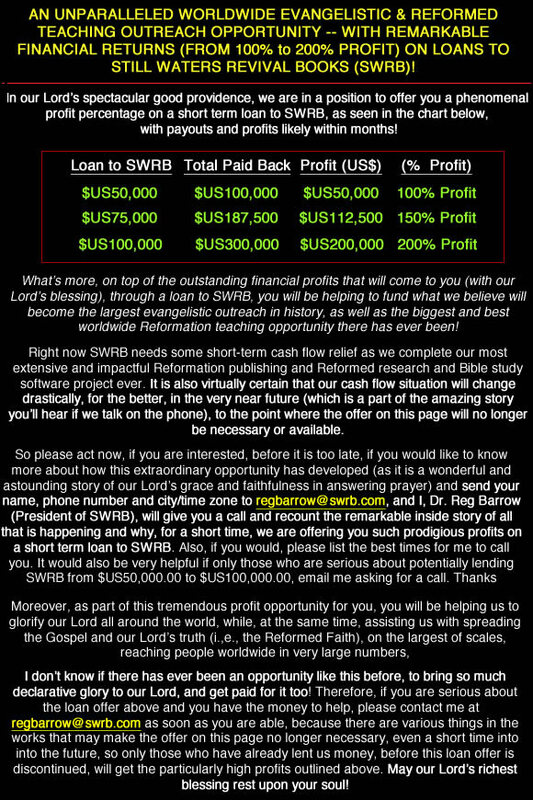 Add yourself to SWRB's PURITAN SUPER SPECIAL email list by using the email sign up form below. Our emails contain our best SWRB sales and discount coupons, notices of new Puritan and Reformation releases, and new FREE Reformation and Puritan resources (i.e. new FREE online Puritan books and articles, new FREE Puritan MP3 audio sermons and classic Reformed audio books, and new FREE Reformation videos). Your email address will be kept private (as we do not sell or trade email addresses in any way) and you may remove yourself from the list at any time -- an easy one-click remove link comes with every email. This is also a double opt-in email list, so we will email you to confirm your email address and to confirm that you want to join our list, after you have submitted your email below. Join today and you will soon have a wide selection of the world's best FREE Puritan Books, Reformation MP3s and Calvinistic videos just a click away. All prices are in USD Most shipping from our USA facilities. Copyright 2019 Still Waters Revival Books.